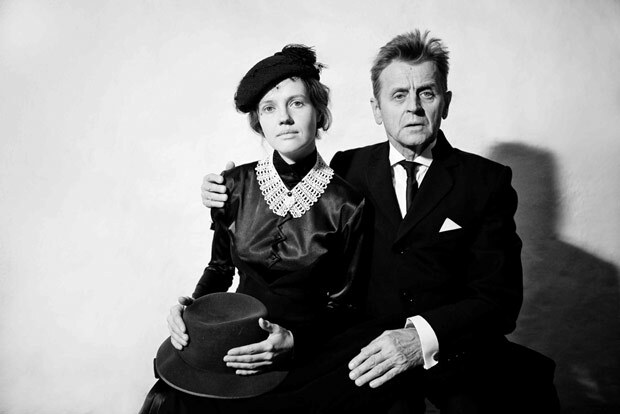 Eight years ago Mikhail Baryshnikov appeared as an actor in Forgotten Christmas, or the Doctor and the Patient at Berkeley’s Zellerbach Playhouse presented by Cal Performances. He had commissioned this theater piece from Rezo Gabriadze, a Georgian writer, director and puppeteer. The internationally-acclaimed dancer now returns with In Paris for three-week run at the Roda Theater, co-presented by the Baryshnikov Arts Center, Berkeley Repertory Theater, Dmitry Krymov Laboratory, and the Russian Century Foundation, in association with Korjaamo Theater, Helsinki. I wasn’t so taken with the previous work and was curious to see this new commission. The play, directed by Dmitry Krymov, is adapted from a short story of the same title by Ivan Bunin, a Russian émigré and Nobel laureate, who lived in Paris from 1921 until his death in 1953. Set in the French capital in the 1930s, the simple plot concerns the retired White Russian general, Nikolai, who now writes the history of the wars in which he fought, and the much younger Olga, played by Anna Sinyakina, who works as a waitress in a Russian café. Advance publicity calls it a love story, but I beg to differ. During the long interval while the audience meanders in and finds its seats, and before the house lights dim, a man in a double-breasted greatcoat, lingers in the shadows of the dark, curtainless stage. It’s Baryshnikov, but he does not call attention to himself as he slinks from place to place along the edges of the space. Most of the spectators are busy talking and don’t notice him. Once the action begins and Nikolai starts to tell his story, projected words cover the entire stage, both walls and floor. I am not here to read the story; I want to watch a tale unfold through the actions and dialogue of the characters. Only the super-titles translating the Russian and French spoken by the actors are really necessary, and even then, if the actors were truly expressive, the projected words might be dispensed with entirely. (Watching the ballet Romeo and Juliet performed by great dancers proves this point.) This verbal deluge is only a foreshadowing of what is to come. I often find myself engrossed in the endless stream of very inventive gimmicks that serve as scenery, props and costumes and wonder if they really assist in furthering the narrative or revealing character, or if they are merely for novel effect. Intellectually I can come up with explanations, but for me art in any form is about being moved emotionally by the direct impact of what the senses perceive. Feeling versus thinking. The music by Dmitry Volkov is the one element I find evocative and intriguing. Employing a variety of sounds created by five performers who act as background players, the music runs the gamut. Glass bottles blown across their mouths like pan flutes, weaving melodies and rhythms that sound like an underwater street organ, and the sotto-voce choral singing of non-words, reminiscent of Gregorian chanting, gently support the action without overwhelming it. Soprano Maria Gulik also sings arias from Bizet’s Carmen. It is understandable that when Nikolai and Olga go on their first date they might be awkward. If they are both having deeper feelings and are unsure if those sentiments will be reciprocated they would being trying to be a bit protective and secretive. But I don’t feel they care that much for each other so the awkwardness takes on other possible meanings. They may be hoping that they will start to feel more for each other as they spend time together or they may simply be lonely opportunists who would rather be with someone, anyone, as long as the person speaks Russian, than be alone. At the end, Nikolai dies and, no doubt inspired by the Bizet music, once in heaven he dances a matador solo choreographed by Alexei Ratmansky. Had I not seen two flamenco groups and three Don Quixote performances in the preceding two weeks, I might have been more impressed. 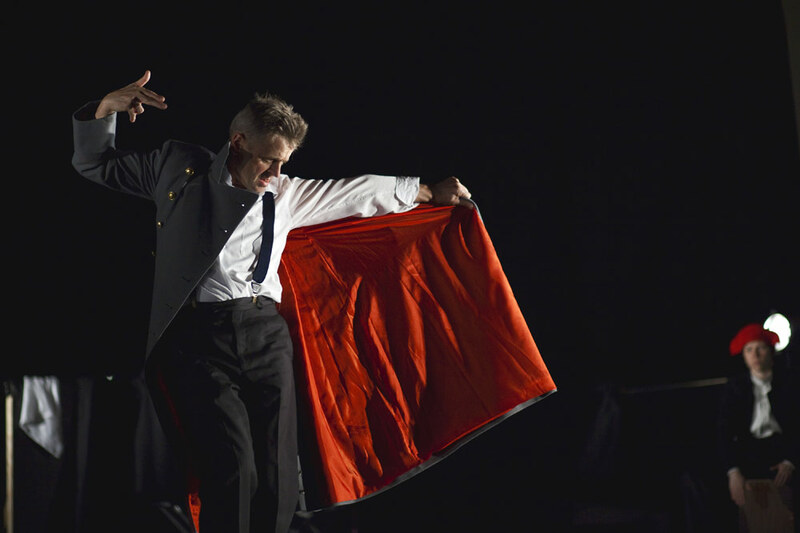 Baryshnikov, now 64, still moves with style and finesse, but the choreography doesn’t offer any opportunities beyond a pseudo-Spanish cliché. Some might find this supposed love story touching, but I come away disappointed, not just by the lack of any sign of real love between the main characters, but because the meticulously planned stage effects – set, props, costumes, projections – only really hide the absence of a meaningful core.